SHUG Policies Part II: How Much is That Galgo in the Window? Juan, one of our Galgos still looking for a permanent couch, has a $650 adoption fee. 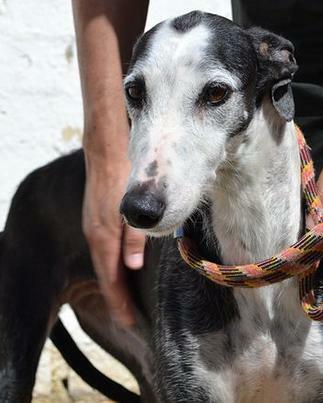 It’s $650 to adopt a Galgo from Spain, and that includes their flight from Madrid, crate, neuter, vaccinations, etc. That’s the short answer to the question we're asked most often. Here are the details . . . If you're adopting any dog from overseas -- a Galgo, Saluki, or other Sighthound that SHUG paid to have transported from outside the U.S. or Canada--the total fee is $650. That's the TOTAL fee. Most of our dogs fly into JFK, Chicago or Washington D.C., but we've also had flights into Miami, Seattle, Los Angeles and Dallas. Your dog's adoption fee includes their flight to the U.S. and their transport to their foster home -- which might be anywhere in the U.S. or Canada. SHUG prefers to foster our dogs before they go to their forever families. Once a dog is ready mentally and physically for their new home, ideally their adopter will personally pick them up from their foster home. We feel that provides the smoothest transition for the dog -- and gives us the opportunity to meet you in person and answer any questions you may have. You can drive or fly your dog home. However, we know this isn't always possible. We adopt to homes throughout the U.S. and Canada. In practical terms, that means we spend a lot of time getting dogs from point A to point B. We have two options available to adopters who can't pick up their dogs in person. First, we have a network of volunteers who help us move dogs. We've gotten especially good at moving dogs up and down the East Coast--from Florida to Toronto. Keep in mind that we’ll try to find drivers to move your dog to you--or closer to you--but the final approval of the transport plan always belongs to SHUG. If there are holes in the plan or it just feels like too many hand-offs for this particular dog, we maintain veto powers. 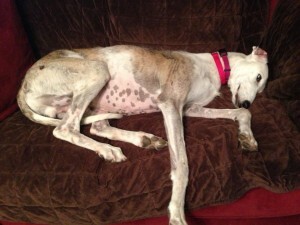 Pretty Maxima, another Galgo available through SHUG, has an adoption fee of $650. The second option SHUG uses to move dogs within the U.S. and Canada is United Petsafe. If you choose to have your dog flown to you, the cost is based on weight and usually ranges from $300 to $450. You pay the actual United fee and SHUG will do all of the work and provide the crate for your dog to fly in. We’ll make the reservation, pay for your dog to have another vet check and official health certificate, prepare the paperwork, prepare the crate and take your dog to the airport. We’ll get your dog checked in and stay with them until they're taken to the runway to board their flight. We ask that you be at the destination airport before their plane lands and you usually have them in your arms within 30 minutes. And . . . that's it. There are no hidden fees. Your dog comes spayed or neutered, with updated rabies and distemper vaccinations. (We'll do another post about which shots we do--and DON"T--recommend). Your dog will have been tested for heartworm, intestinal parasites, tick-borne diseases, and leishmania (if coming from the Mediterranean area). What's our secret to keeping our international adoption fee so low? You are -- all of the wonderful people who support SHUG. We can do it because of the flight patrons who bring us dogs (just so you know, we don't pay for their tickets) or who donate miles for others to come get dogs. And we can do it thanks to those who donate. Your donations go directly to subsidize our veterinary and transport expenses. And that's it. Every time you donate to SHUG you're helping a dog get adopted. We're still hip deep in summer and we've already saved as many dogs in 2014 as we did all of last year. We couldn't do this without your help. Thank you! $650 was totally worth it for Meri. She brings so much energy to our pack and often that $650 has saved her from demise when she gets into trouble. Please consider the free transport service of Kindred Hearts Transport Connection when moving dogs through out the USA as an alternative to flying. A totally volunteer group with a nationwide member count of around 15,000. Please contact me at cggelwicks@yahoo.com if you are interested in more information or check out KHTC’s Facebook and webpage. Thanks, Clarence. I believe we’ve touched base with you in the past. Thanks for the reminder. Thank you for all of the work, lives you save, joy you spread. Our sight hounds give so much love. A home is not a home without a special canine. I live in N.C. would you consider a foster program here. Would love to adopt too! We have many foster homes in North Carolina! Please fill out the foster application on the website and you’ll get a call from a volunteer. Thank you! !